It’s Day #7 of the Restoration Project. Join us as we learn to unwind through rest and prayer this month. Darkness was upon us and the garbage cans were overflowing. Our energy was sapped but our resolve to purge was fierce. Our move took much longer than expected. Moving across town proved to be a big undertaking as we hauled trailer load by trailer load between work and responsibilities. We were operating on exhaustion and weary from all the stuff that weighed us down. I cried over mixed tapes and old high school musicals, as I let go and threw them into the garbage. Something snapped as I placed my baggage in the trash— realizing that a part of myself was wrapped up too tightly in my talents and possessions. I let go. It felt vulnerable and scary yet so freeing. I had my memories but I didn’t need to hold on to this stuff—it was weighing me down. I’ve been known to purge deep. One time I “purified” our DVD collection, convicted at some of the garbage we owned, but months later I was mad at myself for going on a rampage. I had a hankering to watch Mamma Mia, but alas I had chucked it. I bought the movie again—this time the sing-a-long version with flashing lights and all. The day after our dramatic de-cluttering, Hubby and I agreed that I should go retrieve a few of the discarded VHS tapes, so I did. But the point of living with less still resonated deep. I do not need to keep excess to be filled. As we curb the clutter we throw away the stress of stuff management. We are freed to rest when we de-stress. We have room to breathe, room to create, when we get organized. I often make the excuse that my creative side has a hard time keeping things clean but as I start telling my stuff where to go, instead of letting it boss me around, I am free to be creative. We can rest better when things are orderly. Sometimes rest takes prep work. But as we tidy up the sleep is sweeter, the lungs expand wider, the rest is more refreshing—at least it is for me. What is one space that you can declutter today? Set a timer for 30 minutes and work on that problem area. Stop letting clutter make you cry and do something about it (preaching to myself!). Throw away some of your stress by eliminating excess and make room for people—make room for what God has in store for you. Let’s purge our homes of clutter and create some breathing room. 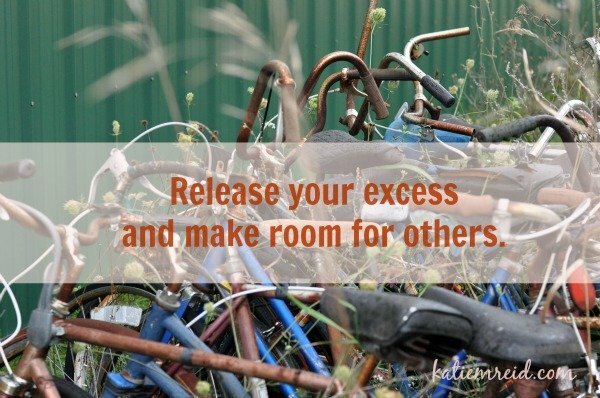 Let’s provide a restful haven for ourselves and others by intentionally eliminating excess. Let’s prepare our hearts for more of Jesus by making room for Him. The Pointed Life is a beautiful new site that provides breathing room for your soul and a quiet place to connect with Christ. Head on over and rest. P.S. 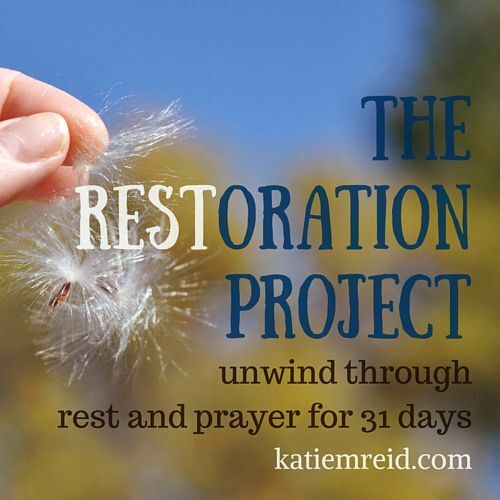 Get caught up on Days 1-6 of the Restoration Project. P.P.S I’m linking up with Jennifer Dukes Lee today for #TellHisStory.